FX Networks has set the premiere dates for several of its most acclaimed and anticipated series, it was announced today by Chuck Saftler, President, Program Strategy and COO, FX Networks. The slate includes Atlanta Season 2, which will be entitled Atlanta Robbin' Season, the series premiere of the drama series Trust, and the sixth and final season of the acclaimed The Americans. Atlanta Robbin' Season kicks off the spring season on Thursday, March 1, 2018, at 10 PM ET/PT, with Trust following on Sunday, March 25, 2018, at 10 PM ET/PT and The Americans on Wednesday, March 28, 2018, at 10 PM ET/PT. Atlanta Robbin' Season, the next season of the acclaimed and award-winning comedy series, will premiere on FX on Thursday, March 1, 2018 at 10 pm ET/PT. In Atlanta Robbin' Season, two cousins work through the Atlanta music scene in order to better their lives and the lives of their families. "Earn Marks" (Donald Glover) is a young manager trying to get his cousin's career off the ground. "Alfred Miles" (Brian Tyree Henry) is a new hot rapper trying to understand the line between real life and street life. "Darius" (Lakeith Lee Stanfield) is Alfred's right-hand man and visionary. "Van" (Zazie Beetz) is Earn's best friend and the mother of Earn's daughter. Donald Glover serves as Executive Producer, along with Paul Simms, Dianne McGunigle and Stephen Glover. Atlanta is produced by FX Productions. The first season of Atlanta won two Emmy Awards as well as two Golden Globe Awards and AFI, Peabody, PGA, WGA, TCA, NAACP and Critics' Choice Awards. Donald Glover's Emmy win made him the first African American male director to take home the prestigious award, one of the many awards the first season of the series has won. 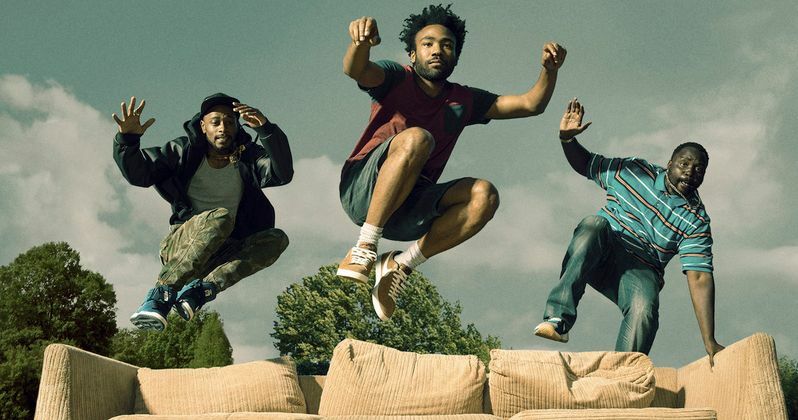 After the success of the first season, FX signed Atlanta writer-producer Stephen Glover, Donald Glover's brother, to an overall deal with the network, while also giving another Atlanta writer-producer, Stefani Robinson, her own overall deal. FX also teamed up with Donald Glover and Stephen Glover on a Deadpool animated series, with the brothers serving as Showrunners, Executive Producers and Writers of the series. Marvel's Jeph Loeb and Jim Chory are Executive Producers. Trust, the first season of the new FX drama series, will premiere on Sunday, March 25, 2018, at 10 PM ET/PT on FX. Inspired by actual events, Trust delves into the trials and triumphs of one of America's wealthiest and unhappiest families, the Gettys. Equal parts family history, dynastic saga and an examination of the corrosive power of money, Trust explores the complexities at the heart of every family, rich or poor. Told over multiple seasons and spanning the twentieth century, the series begins in 1973 with the kidnapping of John Paul Getty III (Harris Dickinson), an heir to the Getty oil fortune, by the Italian mafia in Rome. His captors banked on a multi-million-dollar ransom. After all, what rich family wouldn't pay for the return of a loved one? Paul's grandfather, J. Paul Getty Sr. (Donald Sutherland), an enigmatic oil tycoon and possibly the richest man in the world, is marooned in a Tudor mansion in the English countryside surrounded by a harem of mistresses and a pet lion. He's busy. Paul's father, J. Paul Getty Jr. (Michael Esper), is lost in a daze in London and refuses to answer the phone. Only Paul's mother, Gail Getty (Hilary Swank), is left to negotiate with the increasingly desperate kidnappers. Unfortunately, she's broke. Trust charts the teenage grandson's nightmare ordeal at the hands of kidnappers who cannot understand why nobody seems to want their captive back. The cast also includes Brendan Fraser, Anna Chancellor, Norbert Leo Butz, Charlotte Riley and Luca Marinelli. Trust is created by Simon Beaufoy and executive produced by Danny Boyle, Beaufoy and Christian Colson, with Boyle directing the first three episodes. The show is produced by FX Productions, Cloud Eight Films, Decibal Films and Snicket Films Limited. The Americans will premiere its sixth and final season on Wednesday, March 28, 2018, at 10 PM ET/PT on FX. The Americans is a period drama about the complex marriage of two KGB spies posing as Americans in suburban Washington D.C. during the Reagan administration. The arranged marriage of Philip (Matthew Rhys) and Elizabeth Jennings (Keri Russell) grows more passionate and genuine by the day, but as the pressures and demands of the job grow heavier, the personal toll becomes almost too exhausting to bear. Having revealed their true identities to their teenage daughter Paige (Holly Taylor), Philip and Elizabeth's ability to protect their cover and their family's safety deteriorates. After a particularly fraught mission, Philip and Elizabeth decide to end their tour and take their family home to Russia. However, a game-changing development in one of their ongoing cases forces them to abandon those plans for the sake of the motherland. Now, Paige delves deeper into the family business, even as Philip takes a step back from it. The Jennings struggle to maintain a smokescreen of normalcy, especially around their son, Henry (Keidrich Sellati), who remains blissfully ignorant of the spies in his midst. Their neighbor and Philip's best friend, FBI Agent Stan Beeman (Noah Emmerich), has also yet to discover their true identities. Although he's transferred divisions, Stan remains their greatest threat since his friend and former partner, Agent Dennis Aderholt (Brandon J. Dirden), leads the force tasked with uncovering the Soviet Illegals hiding in plain sight. With Gorbachev in power in the Soviet Union, the winds of change are sweeping through both Russia and America, creating new perils. A growing rift within the KGB draws disillusioned former officer Oleg Burov (Costa Ronin) back into the fray, and may set Philip and Elizabeth on opposing sides as the Cold War reaches its boiling point. The Americans was created by Joe Weisberg who, along with Joel Fields, serves as an Executive Producer and Writer. Graham Yost, Chris Long, Stephen Schiff and Mary Rae Thewlis are also Executive Producers, along with Amblin Television heads Justin Falvey and Darryl Frank, and Joshua Brand is Consulting Producer. The Americans is produced by Fox 21 Television Studios and FX Productions for FX Networks.